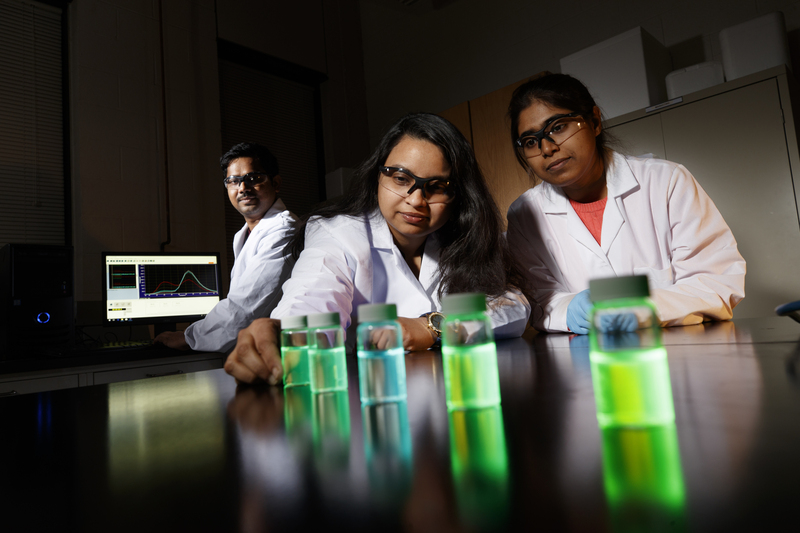 Shudipto Dishari (center), assistant professor of chemical and biomolecular engineering at the University of Nebraska–Lincoln, will present "The Magic of Chemistry" Oct. 21 at Morrill Hall. The University of Nebraska State Museum’s Sunday with a Scientist program for children and families will focus on chemistry, lasers and Lincoln Public Schools student science presentations in the coming months. The events, typically 12:30 to 4:30 p.m. the third Sunday of each month at Morrill Hall, 645 N. 14th St., highlight the work of scientists while educating visitors on science and natural history topics. Regular museum admission will be charged Oct. 21 and Nov. 18, though museum members can attend for free. The Dec. 2 event is free for all visitors. Oct. 21, 12:30 to 4:30 p.m.: “The Magic of Chemistry” — Shudipto Dishari, assistant professor of chemical and biomolecular engineering at the University of Nebraska–Lincoln, is the featured presenter. Visitors can watch a 30-minute interactive chemistry show beginning at 1 p.m. and then participate in hands-on activities to discover how chemistry is used in everyday life. Visitors will learn about next-generation cars and design a car for the future, plus explore fluorescence. Nov. 18, 12:30 to 4:30 p.m.: “The Laser Lab” — Laser technicians and graduate students from the Extreme Light Laboratory at Nebraska will teach visitors about the nature of light and laser technology. Children can participate in demonstrations to learn why the sky is blue, why sunsets are red, and how light bends, refracts and scatters. They will learn how light and mirrors can be used to create an infinite box. They will also learn a few experiments with light and about the future of laser technology. Dec. 2, 12:30 to 2:30 p.m.: “Sunday with LPS Junior Scientists” — Middle and elementary school students from Lincoln Public Schools will present hands-on activities about organisms and their environments to museum visitors. Mentored by undergraduate and graduate students in the Communicating Science Through Outreach course at Nebraska, the LPS students have been hard at work during the fall semester researching and developing activities as part of a Community Learning Centers club. Learn more about Sunday with a Scientist.